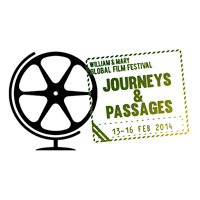 On Nov. 22 at the Kimball Theatre, the W&M Global Film Festival will launch its 2014 theme “Journeys & Passages” with an evening of Chilean-American programming featuring special guests Chilean director Sebastián Silva and American actor Michael Cera. The night will include a double-feature screening of two films directed by Silva and starring Cera: Magic Magic and Crystal Fairy & The Magical Cactus. Cera and Silva will attend the event, introduce their films, and participate in post-screening Q&As. They will also be presented with the W&M GFF’s Global Film Can Award. The event will also feature a Q&A with Cristóbal Ross, creator of the Chilean web series Gringolandia, and a screening of Gringolandia webisodes before each feature film. The GFF Fall theme launch event will begin with a screening of Magic Magic at 6 p.m., followed by a reception in the Kimball Lobby at 8 p.m. featuring Chilean completos (hot dogs with guacamole) and borgoña (strawberry sangria). Crystal Fairy will be shown at 8:30 p.m. Gringolandia webisodes will be screened before each film and presented by Ross. At 11 p.m., the festival will hold an after-party at The Crust, featuring $5 pizzas and themed drink specials starting at $3. Tickets for the event (including both films, reception and after party) are only $5 for students and $8 for the general public, and may be purchased at the Kimball box office. To recognize the spirit of international collaboration that Silva and Cera have demonstrated through these two films, the Global Film Festival is presenting both with the William & Mary Global Film Can Award. This award was initiated by the festival in 2011 to recognize filmmakers who exhibit unique international creative vision and contribute to international understanding, collaboration, positive change and good will. To make these two films, Silva and Cera embarked upon a journey of cross-national c­ollaboration that exemplifies these values, shooting Crystal Fairy as a passion project in the midst of filming Magic, Magic. Both films feature American foreigners in Chile, but they are extremely different in style and tone. Magic Magic is a dark, psychological thriller featuring an American girl caught up in nightmarish and disturbing experiences. Crystal Fairy is a trippy road comedy featuring Cera as an American tourist traveling through the Chilean desert on a quest to find the fabled, hallucinogenic San Pedro cactus. The film was nominated for Sundance’s Grand Jury Prize, and won Silva the Sundance Directing Award. Silva is a director, screenwriter and musician who has worked and studied around the world. Originally from Chile, Silva has studied in Montreal and lived in New York and Los Angeles. His Sundance debut was in 2009, where his film The Maid won the Grand Jury Award. In 2013, Silva premiered both Magic Magic and Crystal Fairy at Sundance, winning the Directing Award for Crystal Fairy. Cera is a Canadian actor famous for his portrayal of quirky, awkward teenagers in films such as Juno, Superbad, Nick and Norah’s Infinite Playlist, and Scott Pilgrim vs. the World, and for his role as George Michael Bluth in the series Arrested Development. In his two collaborations with Silva, Cera plays characters that depart from the charmingly awkward teenage roles that he is known for. The 2014 William & Mary Global Film Festival will take place Presidents’ Day Weekend, Feb. 13–16, 2014, at the historic Kimball Theatre in Colonial Williamsburg and will feature films from around the world, live performances, receptions, and presentations by invited filmmakers. This year’s theme celebrates the 25th anniversary of the Wendy and Emery Reves Center for International Studies, a sponsor of the Global Film Festival. The Global Film Festival launched in 2008 with the support of the Reves Center and the Roy R. Charles Center, to celebrate the 75th anniversary of the Williamsburg Theater. For more information on the festival and upcoming events, visit the website http://filmfestival.wm.edu.